The Screaming Headless Zombie is certainly a new sight for many to see. Most know that zombies do not feel pain and are not affected by the loss of limbs. But rarely, if ever, has anyone witnessed a zombie removing its own head. And yet that is exactly what this zombie is doing. One can only imagine the circumstances that led this zombie to wretch its own head from its shoulders. This impressive and gory decoration depicts the upper torso of a zombie as it rises up from the ground. The zombie wears a tattered and torn white shirt that is stained with dried blood, and its skin is a decayed, brown color, making this zombie look as though it might have been buried for some time before reanimating. The zombies arms are held above its shoulders, where it holds its head aloft, its facial expression a twisted mask of agony. Its mouth is open as though screaming, and its wild, blue-green eyes are bulging out of their sockets. This gruesome decoration sits on a broad base that is perfect for keeping it standing and is easily concealed by leaves, dirt, or other decorations. The decoration is made from rubber filled with light-weight foam and has an incredibly realistic look. The zombie decoration measures 20 inches tall and 19 inches wide. 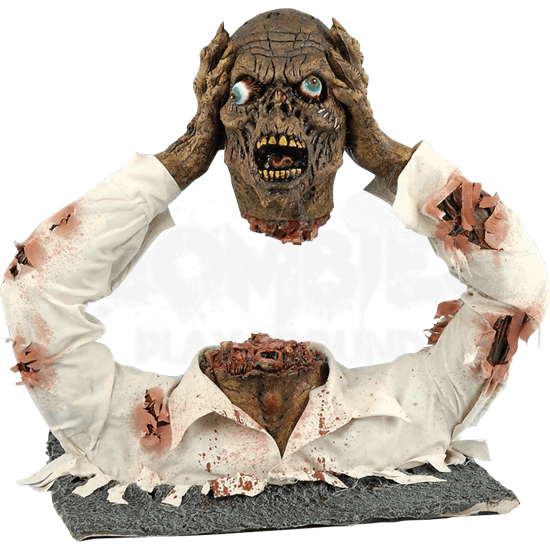 There are many uses that the Screaming Headless Zombie decoration can be put towards, whether you are building a creepy graveyard scene, decorating your house for Halloween, creating a zombie apocalypse, or even constructing a haunted house.